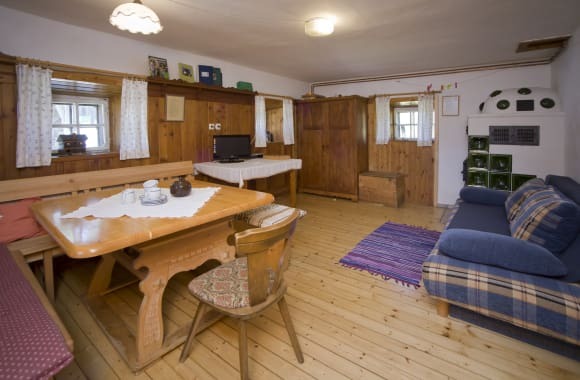 Enjoy staying on our alpine pasture in a beautiful hiking region with unique views of the Murtal. 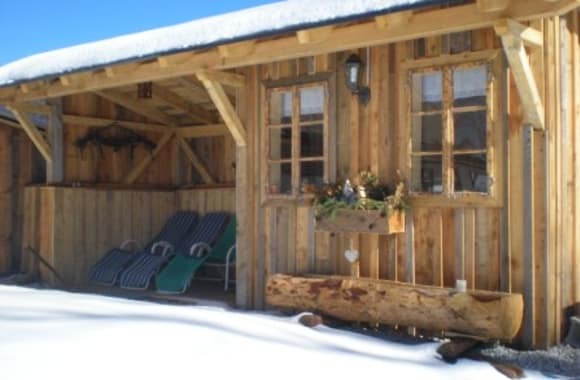 Our cosy alpine cabin is set in a sunny location close to the edge of the forest. The cabin has been carefully renovated, whilst maintaining the rustic character of the little alpine house. 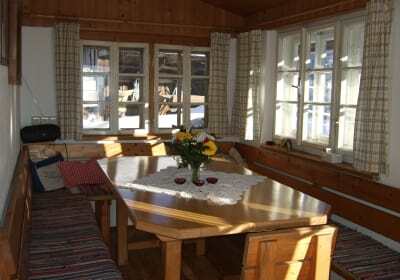 The Grünalm-Hütte is fully equipped and offers contemporary comfort. In summer, lush alpine meadows and cool forests invite you to go hiking and explore the natural surroundings. Mushroom enthusiasts are sure to find a variety of mushrooms to pick. For children there is a playground, a tree house and plenty of space to run around, or they can help the farmer in the stables. The organic farm Gregorbauer is only a short walk away. Our cows are always happy to be milked by the children. Adults are also welcome to have a go and will be rewarded with a schnapps. Upon request you can bring your own horses or other animals. Guided educational forest walks are also available on request. 15 minutes' walk to the farm, where you can buy the farm's own produce. Welcome to the Grünalm-Hütte, which is well-equipped for the winter; tobogganing, skiing, snow ball fights ..., fun for all ages. Those wanting something more relaxing can ride down the alpine path to our farm on a sledge, where you can fortify yourself with mulled spiced cider to help you climb back up again. And back into the cabin, where the heated tiled stove really warms the parlour. A central heating unit provides heating on the first floor, where the bedrooms and bathroom are located. About 6 km away is the Kleinlobminger ski lift (with night skiing) or from Dorf Kleinlobming the Gaberl skiing region can be reached in about 15 minutes by car. Cross-country ski runs, curling or, if the weather is bad, perhaps skittles, and all of this is near the cabin. The Grünalm-Hütte can be reached by car (with snow chains). Natural and white, with vanilla, or refreshingly fruity - our home made organic yoghurt is always: Creamy and natural, simply delicious. Of course the nutritious white stuff is also available in its original form - as milk. Lush grass and aromatic alpine herbs give the Grünalm milk its incomparably full taste. Our guests can also catch their own fresh fish from the trout pond next to the cabin. A little tip: It tastes particularly good with fresh herbs from our alpine meadow. The welcome committee at the Grünalm-Hütte is soft and fluffy and pads along on velvet paws. Our cats live next door in the old stable and are always happy to meet guests who are willing to stroke them. If you happen to let some leftovers fall now and then, it won't just be these domestic tigers that you make happy, but also our four free range pigs. 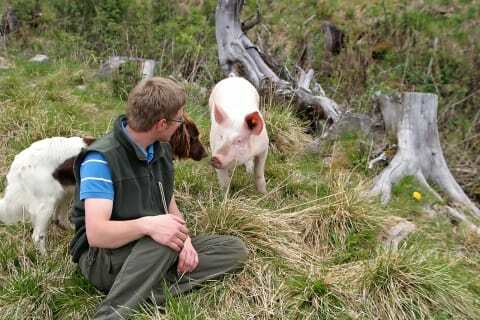 Our pink contemporaries, who have their little meadow slightly to the side of the cabin, are perfectly tame and also enjoy being stroked. Our guests can also get right up to our cows and calves. The farm dog Sophie is also bound to pay you a visit from the nearby Gregorbauernhof. 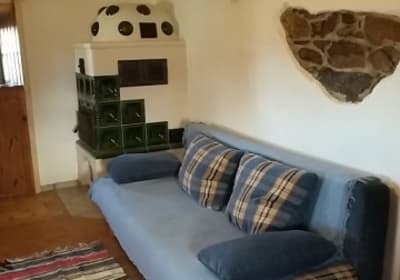 Living area with tiled stove and sofa (double recliner), vaulted kitchen with electric cooker, wood-burning stove, fridge, coffee percolator and kitchen equipment, sunny veranda. A four-bed room (with additional cot), two twin rooms, two shower rooms with WCs.